Looking for details about your event? Click the "Home" icon to the left of "Event Info" on the menu! Ovarian Cycle is a program of Ovarian Cancer Research Fund Alliance (OCRFA). It's a series of indoor cycling rides held in communities all across the country. Each ride's specific details are unique to their event, but one thing never changes: every ride makes an impact, because all funds raised go toward OCRFA's efforts to end ovarian cancer and support the ovarian cancer community. Ride length and format varies by location, with most lasting 3 hours or less, up to a maximum of 6 hours. Ride at a comfortable pace, individually or alongside family, friends, and colleagues. Whether you're a first-time rider or an experienced cyclist, this event is perfect for YOU - as long as you want to make a difference! You can ride in honor or in memory of a loved one, as a survivor, for women everywhere or just for the fitness challenge tied to a great cause. On the day of the event, we all come together for one goal: to fund much-needed ovarian cancer research and programs that will support ovarian cancer patients and one day find a cure for this disease. If you can't physically ride, or don't see a ride in your area, you can sign up as a Virtual Rider. There's no registration fee, and you will not have a bike reserved at an event, but you'll play an important part in raising awareness and funds in your online community. 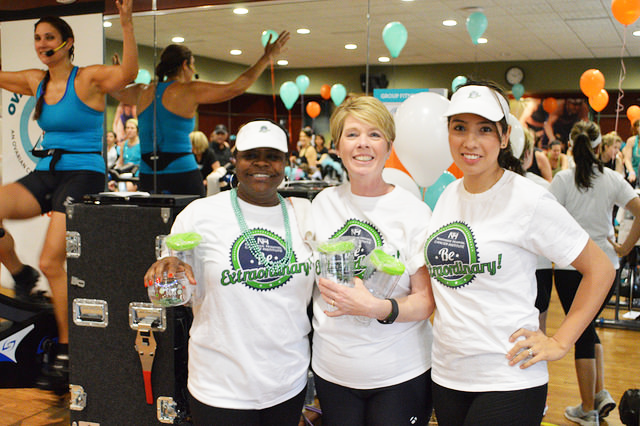 When you sign up, you'll pay a registration fee (ovarian cancer survivors receive free registration!). You'll also get your own personal webpage to customize and share, to raise awareness and collect donations in support of your ride. There's no required fundraising minimum to participate, but if you do, you'll be eligible for great prizes, from water bottles and hats to gym bags and FitBits. With your registration fee, you'll also receive benefits like a free commemorative t-shirt and gift bag, and on-site food and refreshments. Local benefits vary by event location and in some cases will include free optional training in the weeks leading up to the event. In addition to riding, you or your company can support your local event through volunteering, serving on the event committee or through matching donations. Ovarian Cycle also welcomes local and National Sponsors! We're expanding to new cities every year, with the help of supporters like you. Thinking of bringing Ovarian Cycle to your community? Let us help! Woman to Woman is OCRFA's support program that pairs gynecologic cancer patients with survivor volunteers who provide emotional support and mentoring to women when they need it most. Woman to Woman sites with an Ovarian Cycle ride in their area can participate in the event and in return receive a percentage of funds toward their program. In 2011, Ovarian Cycle became a member of OCRFA’s Partners in Science program. The program allows donors to select and sponsor OCRFA-funded scientists conducting cutting-edge research projects, based on criteria such as geographic location, specific institution, or area of study. Ovarian Cycle events that raise $50,000 or more are eligible to participate. Ovarian Cancer Research Fund Alliance (OCRFA) is the largest global organization dedicated to advancing ovarian cancer research while supporting women and their families. As the voice for ovarian cancer, OCRFA funds private research, advocates for increased federal research and awareness dollars and furthers policies that give women access to the services they need, as well as supports women and their families before, during and after a diagnosis. Collectively, the organization has invested over $70 million in private ovarian cancer research and helped to secured over $2.2 billion federal dollars dedicated to ovarian cancer research and awareness since 1998. OCRFA engages the survivor community with programs like Woman to Woman, pairing gynecologic cancer patients with gynecologic cancer survivors and Survivors Teaching Students®: Saving Women’s Lives, an educational program connecting ovarian cancer survivors with health professional students to present their unique stories and facts about the disease. Learn more about Ovarian Cancer Research Fund Alliance.